Meet Michelle Smith - business administration major, Honors College student, volunteer extraordinaire and student organization officer. 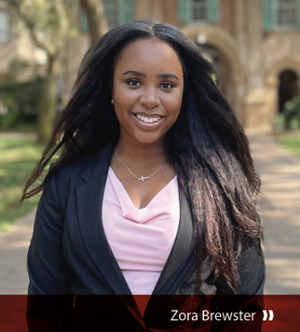 Initially, she didn’t think this would be the right major, but a few experiences in an extracurricular student group opened her eyes and she hasn’t looked back since. “Like a lot of freshmen, I was considering several different majors. Then, I joined a student organization committed to using the power of entrepreneurial action to transform lives and shape a better, more sustainable world – and I saw firsthand how business really can be an avenue for social enterprise. I learned how you can make an impact on people’s lives through business. With that organization, Michelle traveled to Cameroon as part of a contingent of students from the College who were delivering school supplies and computers to several elementary schools there. It was one of two study abroad trips she took to Africa (the other was a semester in Ghana). In addition, Michelle identifies several courses she took in Charleston as highlights of the major. “I definitely liked my management class. It was really a case study course. The professor taught us about several failed situations that actually happened. To have professors with real-world experience in the field is a big advantage because those anecdotes taught me why management style is so important. In another class, Michelle says, “We spent a lot of time discussing corporate cultures. For one assignment, we had to develop a presentation about a CEO and their success. It was fun. I chose John Lasseter with Pixar and developed a Prezi for the class. Our graduates are in demand because they successfully combine knowledge from a liberal arts and sciences curriculum with expertise gleaned from in-depth coursework in accounting, economics, finance, statistics, math, management and marketing. They’re taught in worldclass facilities by experienced faculty with diverse, real-world and academic backgrounds, and benefit from myriad opportunities for hands-on internships and field research.